What is your gaming lineage? Mine started with Text Adventures, Zork, Leather Goddess of Phobos, Hitchhikers Guide to the galaxy. Then onto Graphic Adventures from Sierra, Kings Quest, Liesure Suit Larry, Space Quest. Then SSI games (D&D types) on to RPG's (Dragon Age etc) then finally MMO's - SWG, Gw1, Lotro, SWTOR, Gw2. I have left out a lot but you get the idea. What's your gaming lineage? Computer/Console Lineage: Pong, TI-99-4A, Commodore Vic 20, Atari 2600, Tandy 1000 - 8088, 80286, 80386, 80486, P1 - P4, Intel ever since. Wow. The TI-99-4A. I learned to code BASIC on that back in Jr High. Tape Cassette storage. Ahhhh, memories. I played a similar path. Lived a life or three on MUDs along the way. Look at those system requirements. Oh, when 1 meg was a big deal. First pc, 360k 5 1/4 Disk Drive, 128k of ram. First hd was 20 MEG lol rigged a 720k 3.5 inch drive, and a 286 emulator card. Thought I was bigtime.. lol I see your 1 meg and raise you my first dos was ATT 1.0 and Windows fit on one diskette lol Programmed in Basic, used bascom to compile. Buddy and I wrote a 3000 line simulation of Max Headroom, it ran fun under a minute. Man I miss those days.. I had to return mine it said the owners manual was wrong lol, pretty cool looking though, the brushed metal and black case was great looking. 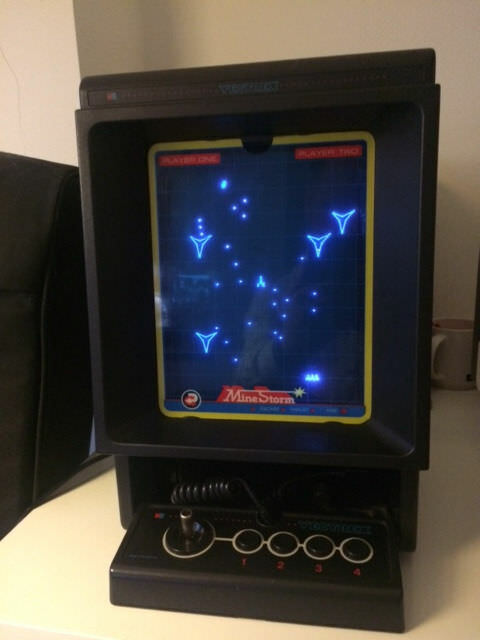 Anybody remember the Vectrex? First gaming system I ever bought, had to save up my newspaper route money to buy it. My pride and joy was still an old 286 who's 2400 baud modem I had to manually ATH0 to connect to the local BBS system with RIPterm. It was a special time. Mine was 300 baud .. I miss the sound and the handshake. Oh, Command & Conquer. A very large part of my lineage too before.....stuff, happened. Anybody remember Acorn? Used to all over the place, including my primary school. Looks like a floor model! Consoles: Atari, NES, Gameboy, Sega Genesis, never really played consoles past that until Xbox. Shout outs to NES Ninja Turtles, Mario 3, Genesis Ninja Turtles Hyperstone Heist, Toejam and Earl, X-Men 1 and 2 (2 was amazing), Flashback, NBA Jam, Sonic, Maximum Carnage. Didn't really get into mobile gaming until the first Iron Man game came out. Forgot about the days and days spent on Star Wars Battlefront 1 and 2 on Xbox with friends, we had a good team. And now Star Wars Battlefront 2 on PC, though haven't played it recently because I really want more campaign content. Great campaign so far, but want more and multiplayer cooperative. Multiplayer pvp only stays fun for so long before becoming monotonous. And of course still playing Star Wars The Old Republic, as well as Guild Wars 2 (though 1 was probably the best MMO mechanics ever). Used to play WoW (Warcraft 3 too though not MMO) and Star Trek Online. Did closed beta for Elder Scrolls Online but couldn't really see myself playing post launch. I should probably mention the ungodly collection of Gold Box games I have too. Menzoberanzan, owns a large part of my soul now. Tie Fighter is my all time favorite SW game (and follow-ups), followed by Jedi Outcast/Academy and the KOTOR games. Really missing the tactical space sim genre these days, Battlefront's fighter squadron mode was such a letdown. The mechwarriror and freespace games were also pretty great. I started with Atari, then Commodore 64/128 then 386. I do not remember all I have played, from old days Tetris and Pac-man are my favorites. My first online was dogfights in XWing vs Tie Figher or XWing Alliance, not sure the name, then duels in Jedi Academy, next step was MMOs: Star Wars Galaxies, Age of Conan, Champions Online, KOTOR, LOTRO, NeverWinter Online, StarTrek Online, The Secret War, Elder Scrolls. and King's Quest checkers and backgammon via the Zone. Did a little X-wing vs TIE Fighter in the Zone but switched to X-wing Alliance when that came out, much better in every respect. I haven't logged into GW2 in a year or so, I really should go back. I keep patching it but I'm busier with SWTOR, catching up on the latest storyline having not played that in a few years. I played very little the pre-CU, the CU appeared soon after I joined. I played mostly in Radiant, these days I log in a few hours a week to an emulator where I found some old players from live. I thought about swgemu but .. it's better missing it I think. I miss the people, and the strong community. I could go on and on. But you know how it was. You had to be there I guess. Also, how could I forget, had some of the greatest times playing Pirates! Gold on Genesis in the 1990s, and the special edition remake on PC DVD in 2003. Also the original Ghostbusters PC game in the 1980s. I liked the Ghostbusters arcade version which was ported to Genesis, but my favorite arcade game (as in, actually played in the arcade) was probably Soul Caliber / Soul Edge, which came out a bit later. Had tons of fun with Chuck Yeager's Air Combat, Jet Fighter, and then later Jane's ATF. Never really got into racing games since the first Need for Speed on PC. People thought Jedi murdered SWG, nope, it was NGE that did it for me. Disney ruin everything. SWTOR got very boring. Having to travel for hours just to talk to one dude was terrible (this was AFTER they added speeder routes), level sync made speeders in general awful and then Command XP all nails in a coffin that's had a corpse in it for several years. Star Trek Online, much like this it's a grind. Also the genocide got old, never thought I'd find genocide boring but there you go. Never actually bothered with WoW as I considered it a hate crime (Warcraft of old was awesome). So, yeah, I don't think I enjoy MMOs all that much. M1 Tank Platoon and it's sequel were fantastic. I remember playing IL2: sturmovik and the expansion which brought in the Pacific theatre, and flying a wildcat vs a zero, and getting a huge apreciation for just how brave US pilots were to fly against the vastly superior zero. The wildcat constantly felt like it was going to fall out of the sky. It was the first sim I played that felt like a piece of history captured in a game (and I've played a ton, from Battle of Britian, jet and helo sims, to a Korean war sim I completely forget the name of).